Sasha Wilkins (aka Liberty London Girl) reviews our Tan Coachella ankle boots. For years and years I’ve suffered from horribly achy legs when I’ve been walking about for more than an hour or so. My feet hurt, and the pain radiates up and down from hip to toes, making the bath my best friend at the end of the day. It doesn’t matter whether I am in ballet flats or trainers – always that awful ache. A couple of weeks back I took my sister in her wheelchair visit to Cruft’s dog show. It takes place at the UK’s largest exhibition centre, the NEC in Birmingham. I pushed that chair for nearly six hours though all six exhibition halls and, by the end of it, a miracle had occurred – no pain. Nothing, not an incipient blister, rubbed toe or heel, or screaming hamstring. 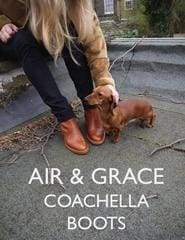 So thank you to my new Air & Grace Coachella ankle boots. Whilst they have the perfect almond toe – no cramped feet, and a heel that’s just high enough to give a lift (I hate being flat to the ground) but still perfect for running around in, the secret sauce is Air & Grace’s patent pending Tender Loving Air® technology (similar technology to that found in running trainers) to provide three layers of luxurious memory foam cushioning cleverly hidden in the soles.